Invisalign is a modern alternative treatment used to straighten teeth without any wires or metals. Invisalign is made of virtually invisible, comfortable and removable aligners that give you the beautiful, straight teeth you always wanted. Invisalign teeth straightening is great for both adults and teenagers. You need t wear a set of aligners for around two weeks. You can only remove them for eating, brushing and flossing. After every two weeks, you change the aligners as your teeth move a little every week – until they are straightened and move to their final positions. For patients looking for affordable Invisalign New Hyde park dental experts at NIDA are here to help. Total treatment typically lasts between 9 to 15 months, and the number of aligners worn during the treatment is usually between 18 to 30 (the number can vary from case to case). Teeth straightening can be a grueling process involving uncomfortable metal brackets. It also involves multiple visits to dentists for tightening the brackets and checking that there are no problems. But all this changed with the treatment of Invisalign New Hyde Park dentists at North Island Dental Arts provide. Invisalign treatment from North Dental is an advanced way of straightening your teeth. Our team of dental experts is dedicated to helping patients achieve beautiful smiles using Invisalign at our New Hyde Park, NY clinic. We have been serving patients with Invisalign in Port Washington, West Hempstead and other nearby areas for years. Since each patient is different, the Invisalign aligners are made to custom fit the individuals. The treatment starts with our dental team taking x-rays, bite patterns and impressions of teeth. This is sent to the technician along with the dental treatment plan. The technicians create 3D teeth models of the current state of your teeth and the final state that the doctor has visualized. The models of the different steps of teeth movement are created and aligners for each step are created. Depending upon the condition of the teeth, the aligners vary. Contact us today to find out more about North Island Dental Arts Invisalign treatment. Q: I am looking for cheap Invisalign near me in New Hyde Park, how experienced is North Island Dental Arts with the treatment? North Island Dental has an office conveniently located in New Hyde Park on Long Island, and we are available to provide in-office Invisalign for our patients, as well as recommend the best methods for keeping your smile bright after your whitening. Many different substances can stain your teeth, and the best way to help your smile is to come to our office and find out more about our Invisalign procedures. Q: I want to straighten my teeth but I don’t want braces, how do I know if I am a good candidate for Invisalign? The best way to find out about all of your teeth straightening options is to set up an appointment at our office. Our dental experts will assess your smile and all of the areas that it can be improved, and go over in detail all of the different treatment options that are available to you and might be helpful for your specific goals. Contact our office today and come in for your consultation about Invisalign treatment. 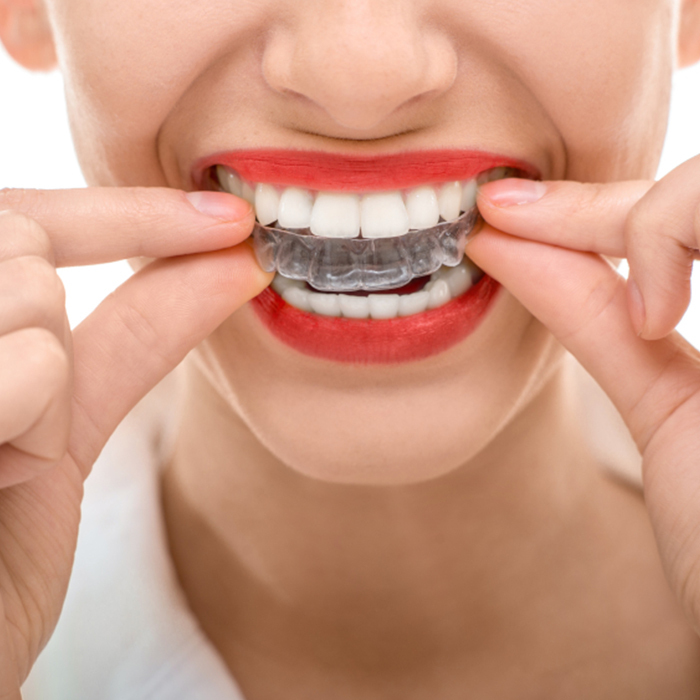 Q: How many times do I need to change the aligners? Every case is different, as everyone’s mouth is different. Some people require as little as 9 months to get their desired results. However, some people require more time due to a variety of factors including how much the teeth need to be shifted. Q: Can children or teenagers get Invisalign treatment? Invisalign was originally designed and intended for adults, but there is an Invisalign treatment for teenagers. There are some extra features that help this treatment work specifically for the growing teeth of the teenager, and special tools to help the teenagers stay on track when it comes to wearing their aligners. To find out more about Invisalign for your teenager, contact us today to schedule your appointment. We are happy to answer all of your questions while we perform our assessments of the patient’s smile. Q: Are the aligners easy to clean and maintain? Yes, Invisalign offers patients a very user friendly experience when it comes to maintaining the aligners. There are some specialty Invisalign cleaning systems, but many patients can be cleaned simply by brushing them with a regular toothbrush and rinsing with water. It is important to maintain the cleanliness of your aligners as this will be a factor in your overall oral health.